Length Units Converter is a free Windows 8 unit converter app that is available under the ‘Tools’ section of Windows 8 app store. 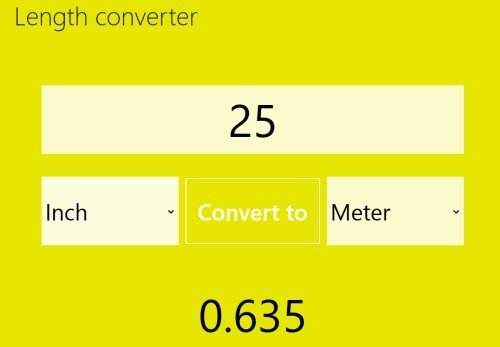 This unit converter Windows 8 app lets you convert values from one unit to a desired one. Units such as meter, foot, inch, yard, and mile are included here in Length Units Converter app. It’s a very useful app that can be kept snapped on a side of the screen while you are working with imperial and metrical system. All you need to do is just input the value in the box ? select the units between which you want to convert and click on ‘Convert To’ button to get the result. 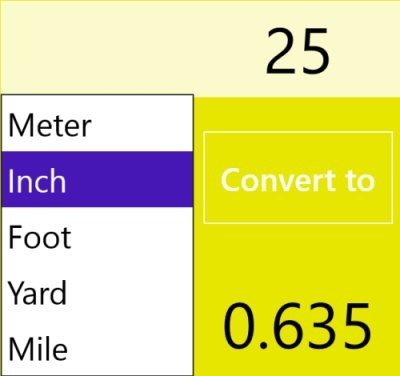 Let me quickly point out the main features of this unit converter app for Windows 8 below. Lets you convert between four different units, under ‘Length’ category. Lets you keep snapped mode for quick usage. Units such as meter, foot, inch, yard, and mile are included. Well.. I really liked this unit converter Windows 8 app that quickly converts different units of length. Let me bring you the link from where you can easily download this app. Also, check out our posts on Unit Converter Apps, Weather Apps, and BMI Calculator Apps. Now, you need to click on ‘View in Windows Store’. You can now proceed with further installation steps and get the app instantly. In short, Length Units Converter is a good utility unit converter Windows 8 app to convert between four different units. Go ahead and download Length Units Converter app in Windows 8 now.